This old-fashioned Southern fried chicken recipe is an excellent choice. The chicken is fried to perfection and served with simple creamy milk gravy. The gravy is a typical accompaniment, and it's very easy to make with some of the pan drippings, flour, and milk. This is the Southern dish everyone loves, and it is very easy to prepare. Use a heavy, deep skillet or sauté pan for the chicken pieces. You begin with the dark meat because the chicken breasts take less time to cook. The best way to check for doneness is with a reliable instant-read thermometer. Insert it into the thickest part of the chicken pieces, but take care to keep it from touching bone. The chicken is cooked to at least 165 F, the minimum safe temperature for chicken (USDA). Put about 1 to 2 inches of oil or melted shortening in a deep skillet or Dutch oven. Heat the fat to about 350 F.
Combine the flour, salt, and pepper; sift into a pie plate or wide bowl. Roll each piece of chicken in the flour and place in the hot fat. Put the largest pieces in first, in the hottest part of the pan. When all pieces are in the skillet and heat is regulated (try to keep it at 350 F), cover and cook for 5 minutes. Remove the cover and turn chicken pieces when the underside is well browned. Replace the cover for another 5 minutes and then remove it and let the chicken cook in open pan until the bottom side is browned. About 30 to 35 minutes in all will be required for cooking chicken if the pieces are not overly large. Try to resist the urge to turn the chicken more than the one time. The fat should be deep enough to cover the pieces when it boils up, but make sure you use a deep skillet, preferably one made for frying chicken and watch carefully. 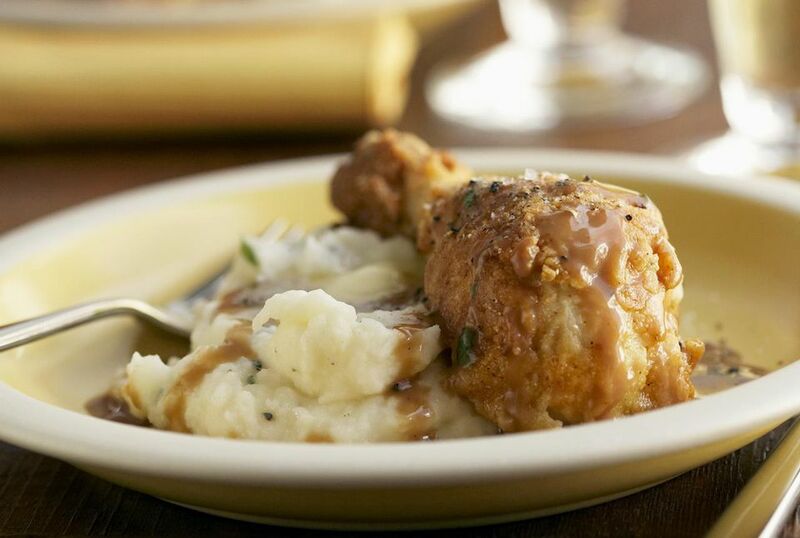 Serve the fried chicken hot with creamy gravy, hot biscuits, and potatoes or rice. For a side dish, try green beans, peas, or corn. Macaroni and cheese is an excellent choice as well. Pour off all but about 2 tablespoons of the fat from the skillet. Add 2 tablespoons butter and 4 tablespoons flour; blend and cook until golden brown, scraping browned bits from bottom of skillet. Gradually stir in 1 cup milk and 1 cup hot water. Stir until smooth and thickened; add salt and black pepper, to taste. Pour the gravy into a serving dish and serve with the chicken and hot biscuits, potatoes, or rice. One reader suggested replacing half of the water for the gravy with chicken stock. Chicken must be cooked to at least 165 F on a food thermometer inserted into the thickest part of the chicken, not touching bone. For boneless chicken breasts, you might like these fried chicken breast cutlets or fried chicken sandwiches. Or try this lighter oven-fried chicken recipe.